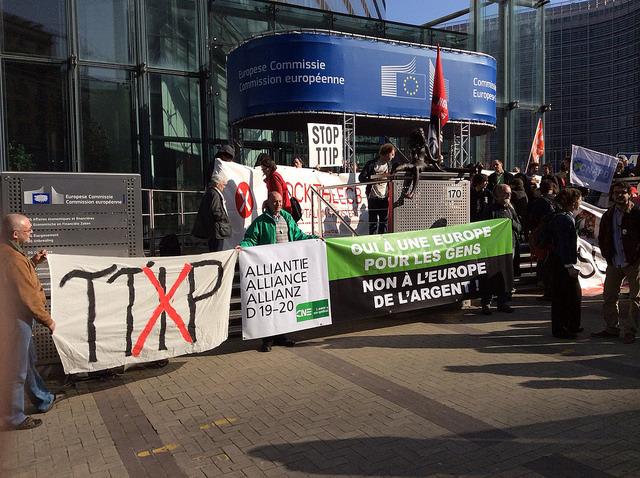 In separate briefings during the latest negotiating round in New York, the US and EU officials said they would push for a comprehensive Trans-Atlantic Trade and Investment Partnership, or TTIP, before US President Barack Obama leaves office in January. “We are not going to shoot for or accept a ‘TTIP light,’ a US Trade Representative official said on condition of anonymity because of the sensitivity of the talks. “It has to be comprehensive, it has to be ambitious and we do think we have the time that we need this year to complete such an ambitious deal,” the official added. But the US officials and their European counterparts said bridging gaps would take a lot of work and that progress this week had centered mainly on non-controversial technical language. They are trying to lay the groundwork to have all but the thorniest problems solved by the autumn. Among the deepest divides concern Europe’s food safety rules that exclude American beef raised with hormones, genetically modified foods and Europe’s many local food naming rules, such as for asiago and feta cheeses. 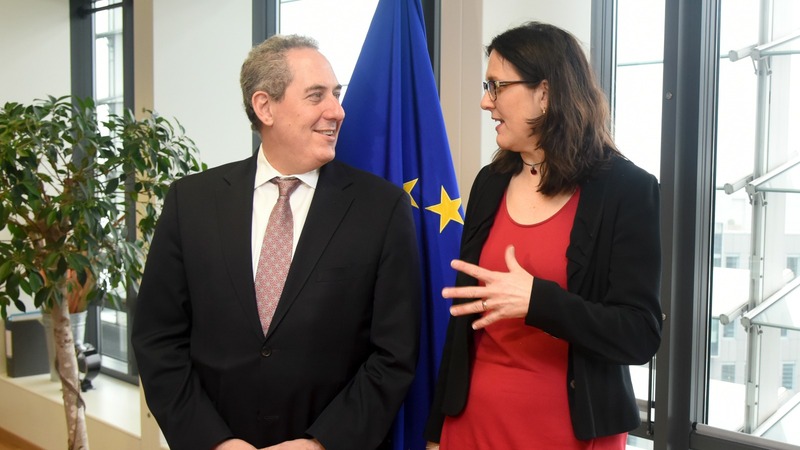 US negotiators have complained those rules have fueled a $12 billion annual food trade deficit with the EU, $1 billion in cheese alone. An EU official told reporters that European negotiators were disappointed in the latest US procurement offer but were determined to keep working toward a deal. Is former Greek Finance Minister Yanis Varoufakis correct when he states the “single largest threat to the global economy”: Europe? “Europe exports deflation — it exports crisis,” says Varoufakis. 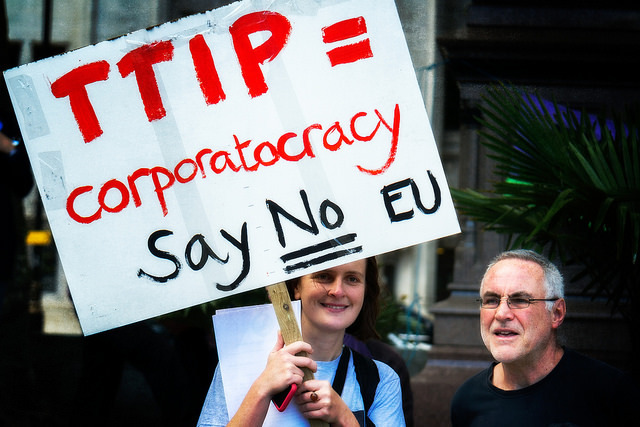 1) The TTIP Investor State Dispute Mechanism which would create ‘secret courts’ where large companies can take action against democratically elected governments for taking action that might endanger their profits. These actions could range from increasing workers’ wages, setting carbon emission limits or ensuring that services are provided in both our national languages. 2) Food standards and welfare are potentially affected because ‘free trade’ with the USA may mean driving down standards, mass-producing lower quality food. 3) The United Kingdom National Health Service will be damaged by this treaty. Because it is possible that multinational private sector companies will seek to exploit loopholes in the treaty to get access to lucrative health contracts, lobbying to get their products on the recommended prescription lists or hiking up drug prices so that we can’t afford the healthcare that we now rely upon. MY ADVICE IS PUBLISH AND MAKE DOCUMENTS ACCESSIBLE AND CONVINCE THE CITIZENS THAT TTIP has their best interest at heart as opposed to taking away their freedoms!